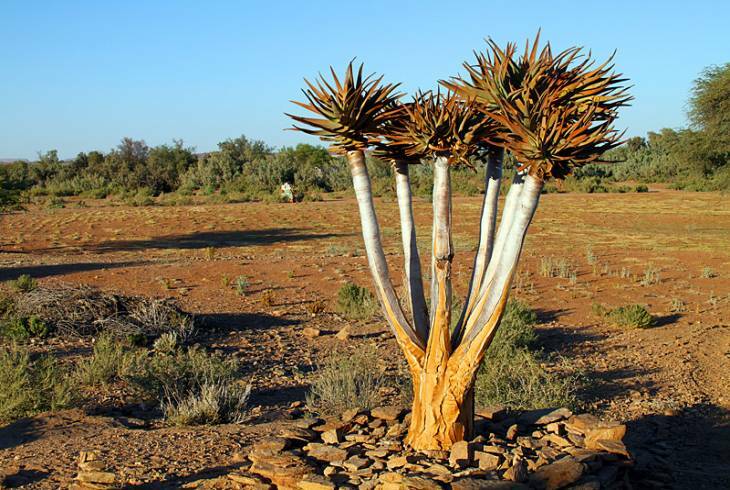 The Northern Cape province, a seemingly vast barren landscape, is perhaps one of the least explored regions of South Africa and remains, for the serious adventurer, an everlasting challenge. This landscape is periodically plagued by drought and scorching sunshine yet it has been astonishingly blessed with some of the most dramatic displays of natural beauty. Nowhere is this more visible than in Namaqualand, one of the six floral kingdoms of the world. In spring, the plains burst into flower creating a breathtaking carpet of brilliant colour. The discovery of an 83-carat 'Star of South Africa' marked the beginning of the world's greatest diamond rush and in Kimberley, resulted in what was to become known as the 'Big Hole', the largest hand-dug excavation in the world. Many of the old buildings are still in existence, museums abound and part of the original 'rush town' or 'open-air museum' has been reconstructed alongside the 'Big Hole' providing an attraction in itself. Equally spectacular in the province are the Augrabies Falls, fittingly named from the Khoi word which means 'place of great noise' and which is the focal point of the Augrabies Falls National Park. The mighty Orange River thunders over a granite cliff into a ravine some 200m deep, forming the world's sixth largest waterfall. Beyond the Orange river lies the Kalahari Desert measuring some 120 million hectares which include parts of other countries such as Botswana, Namibia and Zimbabwe. Of the 12 owl species and 67 raptor and vultures species found in South Africa, the Kalahari is home to 7 and 40 respectively. The Augrabies Falls and the Kalahari Gemsbok National Parks are among the best known of the Kalahari reserves. Across the Northern Cape there are wonderful opportunities for adventure such as river rafting, hunting, hiking or 4x4 trails as well as scenic drives and game viewing. Other treasures include ancient cave and rock paintings, late Stone Age artefacts and more recently, monumental reminders of the Anglo-Boer conflict. Northern Cape Accommodation and Information.